A lot of newbies ask this one question when they are in a situation to take up a soldering task. How to use a soldering gun appropriately, so that they get an effective and error free join? Sometimes the mess-ups are not fun, they end up damaging expensive components. However, you need not always mess up things before you start doing a good soldering job. You can do a good solder by learning few basic steps or considering few important things while handling a soldering gun during the process of soldering. Mind you, a soldering gun is different than a soldering iron. Though both these words are very commonly used for referring a soldering tool, but there is quite a lot difference between them indeed. A soldering gun a much bigger tool when compared to a soldering iron and it can reach very high temperatures such as 350-400 watts quickly. 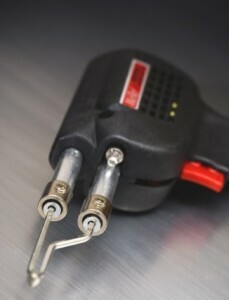 Read this article to know about what is the wattage you need in a soldering gun or iron. Moreover, soldering gun differs in shape when compared to soldering iron and a soldering gun is used for much heavier jobs such as connecting heavy pieces of metal, heavy gauge wires, electrical connections and so on. So, operating a soldering gun is in fact much easier when compared to using a soldering iron because you would be dealing with surfaces with wider join areas and large masses. So, this mini guide walks you through the right steps to use a soldering gun. We are sharing a cool video at the end of this article. So, just sit back and enjoy this post. We will take up an scenario of joining two wires. One is heavy gauge wire and the other one is small gauged. This is how you need to join these two wires using your soldering gun. First thing you would need to do is to wrap these two wires together with hand so that they are now joined. Plugin the soldering gun and heat it by pulling the trigger backwards. Please note that most of the soldering guns come up with settings like this: (Half press : High temperature, Full press: Low temperature). So, select the temperature you require for this join. Clean the soldering gun tip by applying a small quantity of flux to the tip. Wait till the flux melts and then clean up the tip by wiping it to a clean cloth. Now you are ready to do the solder. First, apply a small quantity of flux to joint (to heavy gauge wire) and let it heat for few seconds. Then once it is heated, push solder (tin) to the joint and direct it to small gauge wire. You will notice that there is a little smoke and the solder is done. Don’t ever touch the tip or solder joint with bare hands. Always use appropriate accessories throughout the soldering process. Temperatures are really high here. Want to see soldering process in motion? Here is a good video. We believe, now you got an idea on how to use a soldering gun. Keep trying and practicing. You will be much more accurate with experience.